I posted a couple of weeks ago that American Express Currency Exchange had resigned from its positions in Heathrow Terminal 5 (EDIT May 2014: Amex has now been replaced at all other terminals as well). These booths, including the one in the British Airways lounge, are being replaced by Moneycorp. The good news – if you are spending your employers money – is that Moneycorp is awarding Avios points for walk-up purchases at the rate of 1 Avios point per £1 exchanged. The bad news is that Moneycorp is NOT giving Avios for pre-ordered currency. American Express Currency Exchange remains the exclusive British Airways partner for pre-ordered currency. However, it is now impossible to collect pre-ordered currency from Amex in Terminal 5. How BA got itself into this mess I will never know. The best way to earn Avios from pre-ordered currency is now to book yourself on an airline other than BA, since Amex Currency Exchange still has booths in the other Heathrow terminals! You should never, ever buy currency at Heathrow as a walk-up purchase if you are spending your own money. The rates are so poor it beggars belief. The Travelex as you come through Terminal 5 passport control seems especially poor, with a ludicrously huge spread of around 20% IIRC. I pity anyone who effectively pays Travelex £50 for changing £500 of $ or Euro into Sterling. Use the Amex website (www.travelmoneynow.com/britishairways) and have currency delivered to your home or office. Amex is still charging this as a purchase on Amex-issued Amex cards, which is a fantastic extra bonus. Earn no Avios and pre-order from Travelex or Moneycorp for Terminal 5 collection. You should still earn Heathrow Rewards points at the rate of 1 per £10 spent. Details of BA’s new and confusing relationship with Moneycorp and Amex can be found here at ba.com. How I finally got the IHG Rewards Club '5000 points for a weekend stay' bonus to post! There’s always the option to preorder and pick up at one of the other terminals. Then use the free connecting train to get to T5. Just remember to order for landside collection! Fair point. Not worth it for the Avios alone but potentially worth it if you need to put spend through an Amex. If you pre order for collection at T3 , can you get Heathrow Rewards on it ? Sure can: Avios from the order, points via Amex and then Heathrow Rewards on top. Do you just present you HR card on collection or can you input it on ordering along with your BAEC # ? On collection – with Amex, though, they never posted so I always retroclaimed. Not actually sure if preorders are meant to count for HR, but you always get them on a retroclaim anyway. On sunday, I bought £1026 in usd from amex via ba at a rate of $1.5114 using my amex plat card, and earnt 1026 avios and 1000 mr.
Then my ba amex was declined by amex travelmoneynow ( more later). so i purchased £1005 in usd from fairfx.com at $1.542. This means my 2026 avios have cost $21-$22. not sure about if that how much i would want to pay, when i do a good job of earning them for fee. Now I had read raffles post on amex fx, and was getting frustrated at being unable to buy any more tc’s from amex. First bought £1026 on my partners plat..no prob. then tried 2 buy £2000 on my bapp declined because it was over the £650 per day cash limit, which amex informs me is standard to all bapp cards. next day tried to order £500 declined, amex said there was no reason this is declined, and they were unable even to see an authorization attempt. called travelmoneynow, and was informed that you can only purchase £2500 in any 30 day period, this limit also includes any failed attempts. This is not per card, this is not per person, this per address. I need the USD to pay hotel bill to aviod several currency exchanges in Bali. I had the very same problems for months with Amex and BA travel. Despite many attempts and calls with Amex who confirmed there was NO reason at all for this, I gave up and now go through Virgin Atlantic’s foreign exchange. 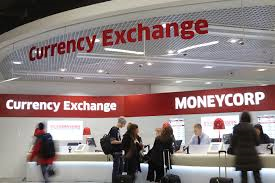 First time success, no problems, Next day delivery, no cash advance fees and 1 mile per pound on Virgin and 1 MR point per pound too..
Amex BdCs at other LHR terminals are to be replaced by Moneycorp on 31 March 2014 when Amex’s current contract expire. The good news is Amex and Moneycorp are planning on offering travelmoneynow pre-order/collection facilities at T5 by the end of this year or as soon as their compliance/risk issues are resolved. Using the mail order AMEX currency service – is it possible to order GBP traveller’s cheques using the AMEX card in order to boost spend & is it counted as a purchase (as foreign currency is)? If so it may be worthwhile to do so despite the fee to then trigger an award & pay the TCs into my bank account to pay the AMEX bill. I was thinking more of when buying tickets with cash , ie. just a search engine that you could select to only show the options on your selected allience. It may be too complex due to codeshares. I think oneworld and Star have different rules on getting miles from a codeshare, eg whether marketing or operating carrier counts. Kayak does a good job pulling in information even when there is a mix of operating carriers in different alliances. Have a look at this screen-shot I pulled from Kayak earlier on the SIN-KUL route (purely for illustration only) which SQ (a *A member) and MH (part of OW) code share. 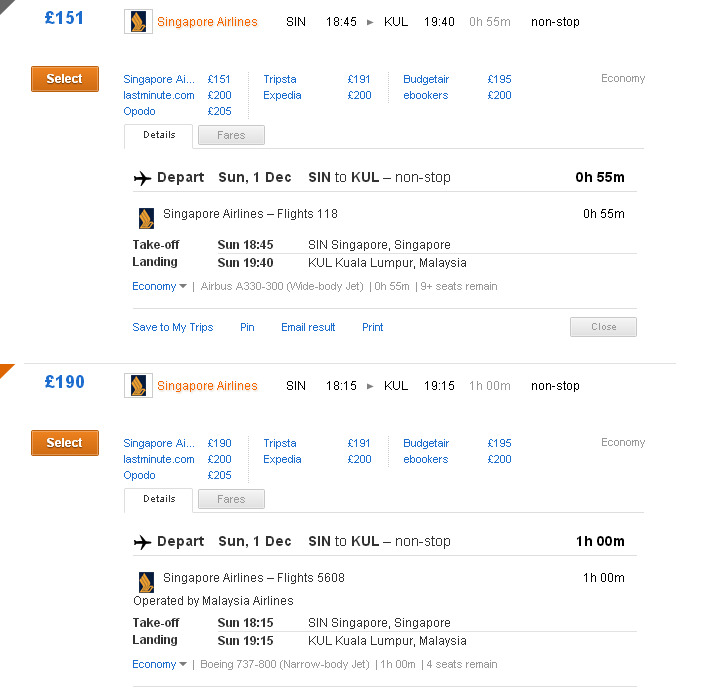 Both the SQ operated and MH code share flights are listed under SQ for example. I can also suggest http://www.fly.com as an alternative to Kayak as you can filter by alliances. I like the old version of ITA. Dosn’t split into Alliances but is easy enough to pick out airlines from the top of page. I think ITA matrix is an extremely powerful air fare search engine but where it fails, at least for the average user, is that you can’t purchase the flights you want directly. You have the added hassle of going to elsewhere to purchase them. I have read that some advanced users have been able to use the results from the ITA matrix search with Hipmunk.com to get the specific hard to find flights or combination of flights (e.g. for a mileage run). Incidentally, Hipmunk.com also allows for filtering by alliances. For those that have access to a printer, and are willing to walk to heathrow central, ICE have the best rates. If you have a printer and are coming from London anyway, you would be far better off going to Thomas Exchange in Hammersmith, Strand or Victoria. Any employee that was this careless with company money would be reminded once and then……………. It doesn’t make it right to trash company money on a few Avios.